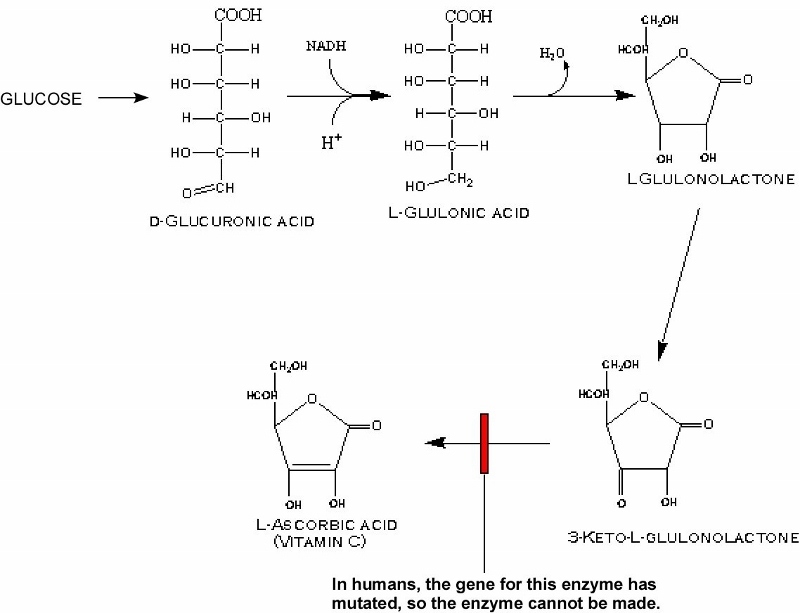 Scurvy is a disease resulting from a deficiency of vitamin C , which is required for the synthesis of collagen in humans and it is required as a redox agent, reducing metal ions in many enzymes and removing free radicals. In this capacity, it protects DNA, protein, and vessel walls from damage caused by free radicals. The chemical name for vitamin C, ascorbic acid, is derived from the Latin name of scurvy, scorbutus, which also provides the adjective scorbutic ("of, characterized by or having to do with scurvy"). In the past, scurvy was common among sailors and other people deprived of fresh fruits and vegetables for long periods of time. Modern cases of scurvy are very rare. The epidemiology of scurvy in the modern era is poorly described. Outside of infrequent epidemics, scurvy is thought to be rare. No outbreaks of adult scurvy have been reported in North America in many years and the last western infantile scurvy epidemic ended in the 1960s. Scurvy is a problem when general malnutrition exists, as in some impoverished, underdeveloped third world countries. Scurvy also occurs in epidemic proportions in international refugee camps and in populations that subsist mainly on cereal grains. Data from the National Health and Nutrition Examination Survey (NHANES 2003-2004) that assessed the prevalence of vitamin C deficiency in the United States among a sample of 7277 children and adults (older than age 6 y) found that men aged 20-39 and those older than 60 years had a higher prevalence of deficiency than similarly aged women. Overall, 8.2 of men and 6 of women were deficient in vitamin C, which is decreased from the NHANES 1994, which showed 14% of men and 10% of women deficient. Scurvy is caused by a prolonged dietary deficiency of vitamin C.
Humans obtain 90% of their intake of vitamin C from fruits and vegetables, and cooking these sources decreases vitamin C content 20-40%. The US Food and Drug Administration (FDA) recommends a daily dietary allowance of vitamin C of 75 mg for women and 90 mg for men. The body's pool of vitamin C can be depleted in 1-3 months. Ascorbic acid is prone to oxidation in vivo, and body stores are affected by environmental and lifestyle factors (eg, smoking), biological conditions (eg, inflammation, iron excess), and pathologic conditions (eg, malabsorption) that may alter its oxidation. Symptoms and signs of scurvy may be remembered by the 4 Hs: hemorrhage, hyperkeratosis, hypochondriasis, and hematologic abnormalities. Hypotension may be observed late in the disease. This may be due to an inability of the resistance vessels to constrict in response to adrenergic stimuli. Heart complications include cardiac enlargement, electrocardiographic (ECG) changes (reversible ST-segment and T-wave changes), hemopericardium, and sudden death. Bleeding into the myocardium and pericardial space has been reported. High-output heart failure due to anemia can be observed. Anemia develops in 75% of patients, resulting from blood loss into tissue, coexistent dietary deficiencies (folate deficiency), altered intravascular hemolysis. The anemia is most often characterized as normochromic and normocytic. Ocular features include subconjunctival hemorrhage, and bleeding within the optic nerve sheath. Scleral icterus (late, probably secondary to hemolysis); and pale conjunctiva are seen. Funduscopic changes include cotton flame-shaped hemorrhages, and cotton-wool spots may be seen. Bleeding into the periorbital area, eyelids, and retrobulbar space also can be seen. Proptosis of the eyeball secondary to orbital hemorrhage is a sign of scurvy. Perifollicular hyperkeratotic papules, perifollicular hemorrhages, purpura, and ecchymoses are seen most commonly on the legs and buttocks where hydrostatic pressure is the greatest. The central hairs are twisted like corkscrews, and they may become fragmented. Poor wound healing and breakdown of old scars may be seen. Capillary fragility can be checked by inflating a blood pressure cuff and looking for petechiae on the forearm. In the nails, splinter hemorrhages may occur. Alopecia may occur secondary to reduced disulfide bonding. In advanced cases, clinically detectable beading may be present at the costochondral junctions of the ribs. This finding is known as the scorbutic rosary (ie, sternum sinks inward) and may occur in children. The scorbutic rosary is distinguished from rickety rosary (which is knobby and nodular) by being more angular and having a step-off at the costochondral junction. Fractures, dislocations, and tenderness of bones are common in children. Bleeding into the joints causes exquisitely painful hemarthroses. Subperiosteal hemorrhage may be palpable, especially along the distal portions of the femurs and the proximal parts of the tibias of infants. Bleeding into the femoral sheaths may cause femoral neuropathies, and bleeding into the muscles of the arms and the legs may cause woody edema. Gum hemorrhage occurs only if teeth have erupted and usually involve the tissue around the upper incisors. The gums have a bluish-purple hue and feel spongy. 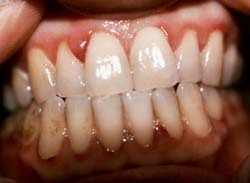 Gum swelling, friability, bleeding, and infection with loose teeth also occur, as do mucosal petechiae. Loss of weight secondary to anorexia is common. Upper endoscopy may show submucosal hemorrhage. Rarely, hematuria, hematochezia, and melena are noted. 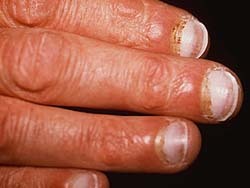 In the late stages, jaundice, generalized edema, oliguria, neuropathy, fever, and convulsions can be seen. Left untreated scurvy progresses, with potentially fatal complications, including cerebral hemorrhage or hemopericardium. X-rays may also be used to check for changes in the normal structure of your bones as thinning of the bones can often occur in cases of scurvy. Therefore, you may have additional blood tests to measure the nutrient levels in your blood. A fasting serum ascorbic acid level greater than 0.6 mg/dL rules out scurvy. Serum ascorbic acid levels of less than 0.2 mg/dL are deficient. levels of 0.2-0.29 mg/dL are low, and levels greater than 0.3 mg/dL are acceptable. Scurvy generally occurs at levels less than 0.1 mg/dL. Laboratory tests are usually not helpful to ascertain a diagnosis of scurvy. Presentation of an infant with the typical clinical and radiologic picture of scurvy, along with a supportive history of dietary deficiency of vitamin C, is often sufficient to diagnose infantile scurvy. Plasma ascorbic acid level may help in establishing the diagnosis, but this level tends to reflect the recent dietary intake rather than the actual tissue levels of vitamin C. Signs of scurvy can occur with low-normal serum levels of vitamin C.
The best confirmation of the diagnosis of scurvy is remains its resolution following vitamin C administration. Noninflammatory perivascular extravasation of red cells and deposition of hemosiderin near hair follicles with intrafollicular keratotic plugs and coiled hair may be seen in a skin biopsy specimen. Obtaining a plasma or leukocyte vitamin C level can confirm clinical diagnosis. The predominant morbidity associated with this disease is a result of hemorrhage into various tissues and depends on the site of involvement. 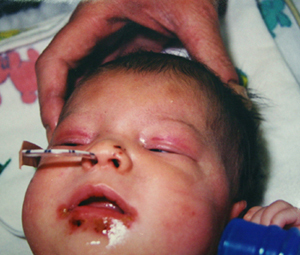 Subperiosteal hemorrhages cause pain and tenderness, resulting in pseudoparalysis. Loss of function at the site of the hemorrhage and anemia are typical sequelae of the hemorrhages observed in scurvy. Subperiosteal hemorrhage in the tibia and femur causes excruciating pain. Laboratory data suggest that the neonatal brain is particularly susceptible to vitamin C deficiency and that this condition may adversely affect early brain development. Until minimal daily requirements of vitamin C were supplied, scurvy plagued prolonged naval voyages and military campaigns as personnel succumbed to its devastating effects. Lethargy, fatigue, and hemorrhagic manifestations of impaired collagen synthesis affecting oral, ophthalmic, musculoskeletal, cardiac, and gastrointestinal structures and functions incapacitated or killed more people than enemy action in many cases. In infants, scurvy is sometimes referred to as Barlow's disease, named after Sir Thomas Barlow, a British physician who described it. Infantile scurvy is uncommon before age 7 months, and clinical and radiographic manifestations rarely occur in infants younger than 3 months. Many of the clinical manifestations seen in the adult are also present in the infant, although in modified form. Early clinical manifestations consist of pallor, irritability, and poor weight gain. In advanced infantile scurvy, the major clinical manifestation is extreme pain and tenderness of the arms and, particularly, the legs. The baby is miserable and tends to remain in a characteristic immobilized posture from subperiosteal pain, with semiflexion of the hips and the knees ("frog leg posture"). Radiological examination reveals defective calcification at the epyphysis, sometimes fractures across the head of the bone and displacement,and haemorrhage encapsulated within the periosteum. The body is both wasted and edematous, and petechiae and ecchymoses are commonly present. Hyperkeratosis, corkscrew hair, and sicca syndrome are typically observed in adult scurvy but rarely occur in infantile scurvy. Infantile scurvy is still encountered sporadically in almost all parts of the world including industrilized countries, where it is attributable to the omission of a vitamin C source in infants fed a cow's milk formula. It is seldom encountered in breast-fed infants since, unless the mother in grossly depleted, breast milk provides adequate quantities of the vitamins.